Those were oak cabinets. The style of the doors and hinges screams 1989. Notice how the knobs are strangely spaced far from the edge of the cabinet doors -- this was a feature on my parent's identical cabs. 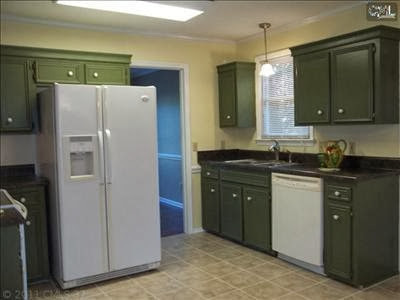 (I designed my parents' kitchen reno 10 years ago, and they had a similar house built the same year as this one.) It isn't hard to putty those holes and re-position the hardware to a more current look, if you are going to all the trouble of adding crown and paint. The vinyl is brown. 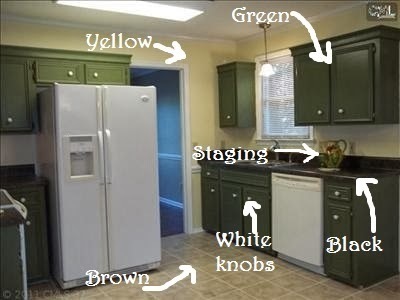 The cabinets are olive green. The walls are yellow. 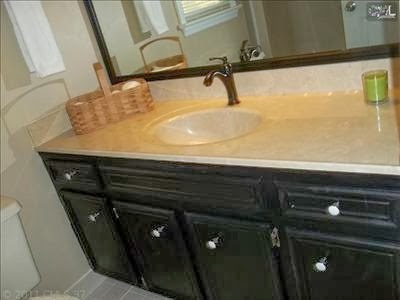 The countertops are black. The knobs are white. (And the flooring in the adjacent room is a red-toned wood, from the look of it in another photo). For the buyer who does not have design experience, they may not be able to point out every mistake -- but they will not feel impressed. In the bathroom they painted the old cabinets, black this time, but left the knobs in the odd position (and white, to boot - which doesn't relate to any other finishes), and glued some molding to the plate-glass mirror. Given what I know about the area and the asking price, this will not fly. Details matter and paint does not always add value! It all depends. If you're a buyer, you won't be fooled by new surfaces & finishes that aren't coordinated, and/or half-hearted paint jobs. The days of being able to slap a coat of paint on your 1980's cabinets and have the buyer falling over themselves to give you their money are OVER. If you're a flipper, well... #1. 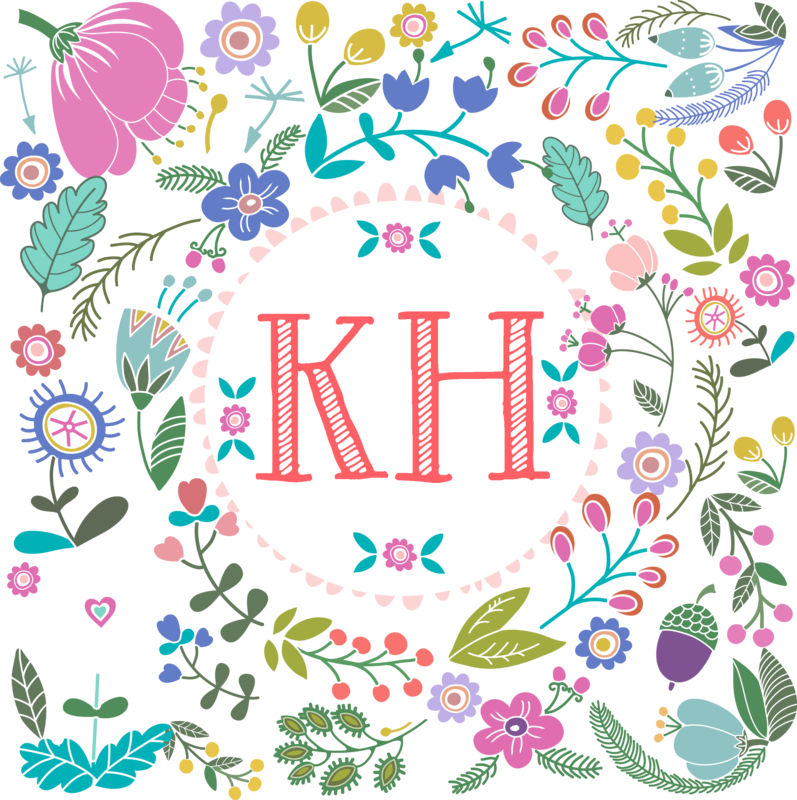 Get Houzz & Pinterest accounts and look at them a lot, and #2. The house above could have sold already if the hardwood floors were a nice medium brown color and they continued throughout the main floor without breaks, and you probably could have skipped all of the cabinet painting. P.S. And your price should be tethered to reality, preferably under-cutting the comps. P.P.S. - Wow it appears I have really strong opinions on this subject!! I do have more ~ Part #3: Bad Bones & Staging Gone Wild - we'll see if I feel brave enough to show you that one. I am afraid all of these flippers are going to find me. !